Is career change at 40 possible? Let master career coach, Unre Visagie, guide you through the process of getting started with a career change. If you apply these steps, you will create an effective and peaceful start to your midlife career change. We are looking at the subject of career management and career change at the age of 40. I have gone through that myself and looking back at my life I would never have started all those businesses, I would have managed my career towards wealth, fun and profit, if only I knew how at the time. Let us look at typically what defines the age of 40. If I remember all the people and myself in our companies it is an age of big responsibilities; where we are busy helping the new generation, being responsible for the current generation and its difficulties and we are helping the old generation on its way out. It is something we want to do. It is also the time I am forced to look at the rest of my life, we have found that it always happens around age 40, plus or minus a few years. We are mid-career when we are in our forties and we have to look at what we are going to do for the rest of our working life. We are often in a trap where I have become my job title and my job title defines me. Whereas I am actually many things: I am a friend, a parent and so many other things. Work is just one of the things I do; it does not define me. What I am, what I think, what I feel and what is within me define me and work as a small part of me. What I would’ve liked to see when I look back, I would’ve like to have seen that my work was more aligned, with nice challenges, while having fun, earning more money and building wealth. I would have liked to see that I have grown in myself, in what I do, with whom I do it, where I do it, and that I had more choices about it. Choices really are the spice of life. 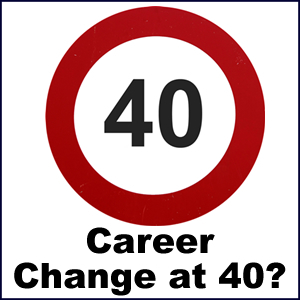 Let us look at a quick process to define and start your career change at 40. What I would have liked to do differently for all the people in the companies I built over the past 30 years. What have I done in coaching since then have been very successful. Typically, the people that follow this process grow their salaries by 20 or 30% over 18 months. They look at work differently, they approach challenges differently and always respond in any situation to grow their options and increase their choices. Where I personally coach people through the Career Maker process, I regularly work with people who never realized that they had choices. I recently had somebody who has so many choices and never realized that he had all these choices. All the choices threatened him, because he saw them as difficult choices to make. When we turned it around and aligned the choices with what he wanted, the choices quickly reduced to two or three. These we investigated and he engaged. He is on his way to double his salary from $150 000 per year to probably $300 000 per year by just looking at things differently, he went external to trusted advisors, and he internalized the advice they gave him. He is now comfortable that the road forward is clear, he knows what to do next. The outcome is that you are organized, you take action and you ensure your growth. Everybody loves a man with a plan. Everybody loves a man who is positive, clear, committed, who finds joy and things to do and contributes. For whom there is always a solution, but at the same time, he clearly knows what work to say no to. Change is so fast today that you may have to choose again in five years. When you have applied this process a few times, change becomes a simple and fun matter. If you look at your career, the company you choose, the industry you choose, yes you can choose them all, that is for sure. It is just a process of identify, prepare and engage. Go external, bring it internal, and at 40 you typically have most, if not all, of these skills and access to these resources. When considering a career change at 40, you do not want to jump ship. You want to progressively change ships. Most people at 40 have big responsibilities. You need to view your career change as a process, rather than a moment’s choice. You will use your current work base to gently shift careers. You do more and more of the work you want to do, and less of the work you do not like doing. I found in my coaching that many people can make small changes in their current careers which leads to them becoming very happy right where they are! They never had to change careers, just recognize the opportunities they already had in their current jobs differently. If it turns out that someone really must make a career change at 40, they have no obvious opportunities in their current jobs, I coach them to use their current job platform and reach out to external sources of knowledge and opportunity. They do this while they stay at their current job and steadily build connections to the right people and places. In both cases we need to align the work you want do with the job you want to do in the company you do it, even if you remain with your current company. There are some very simple, easy processes to delegate what you do not like. Well-executed delegation frees your time so that you can focus on the work you want to do. View delegation from the perspective of “Others must grow, do not steal other people’s work”. While you delegate the work you do not want to do, volunteer for the work you want to do. Also, get further expertise outside of the company, in specific places, investing in yourself, or just participating for the benefit of those you want to learn from; grow the skills that let you move the job progressively to what you really want and what aligns with you. When you are clear on your career, company, industry, work and job in the company, you are on your way to building a long-term career, remembering a job is just something you do on your career road. If you look at a career aim once you are clear about industry, company and yourself, it is so simple to make your career aim visible. Use online tools like LinkedIn to make your career aims visible. You will find that jobs come to you to fit your career aim. The real change happens when in a few months you announce your career aim, your support structure: your family and friends are with you and you are prepared for a career change. You have done your thing, you have engaged, and you are ready with the resources, to move in the direction of your career aim. Remember that career aim is something that keeps on moving, because our environment keeps on changing. However, at any one time, you must have a clear career aim. You are going to adapt it to embrace change, love change; change is so exciting for the prepared. Change is so threatening to people who are not prepared, remember that fear of change at 40 is simply facts that present themselves as if they are real and they are actually perceptions. Therefore, if you overcome fear, that nasty four-letter word, you overcome the risk you perceive and the risks are never real. If you move progressively, you identify, prepare, and engage, you never take a big risk. It is an incremental process, you move towards your career aim. You should probably aim to align your career every two to three years; that is about the change cycle now. New opportunities arrive as the industries move, some disappear and some industries arrive. Humans always need a challenge, a change, remembering that change is as good as a holiday. I hope we have shown you that at 40 there are typically these things happening in peoples’ minds. They can align with what, who, where. They can do a quick start, moving from their basal store, they can organize, take action and grow, and they can align perfectly towards a long-term career aim. You earn according to a self-driven identified and claimed results. Investment in your effort, growth, team, etc. Direct contribution paid when the money is in. The production loop elements included choosing, planning, identifying, delivering and claiming. To identify and claim your slice of the results is an enriching experience in many ways. You learn what others think and you get more money! You gather the information similar to a practical “Portfolio of evidence”. It is discussed in the team, agreement is reached and the pie is sliced. The money is paid. CONCLUDED! In case of differences we grow even faster by getting external views and expertise. The external uninvolved person listens, integrates to interactively give a considered solution. Typically we agree at this time. CONCLUDED! Should we not agree, each party get their own expertise, they listen and ask again. The three makes a final decision. CONCLUDED! While this exiting learning experience runs, we can already work together since the challenge moved external. Look at the past year and try to identify and describe definitive growth and performance. What are your current task opportunities in the projects? Industry fit: It is necessary to ascertain your position, task and goals in relation to the industry requirement. Search for jobs that more or less describe what you are doing, or what you think you can do / want to do. The jobs you find might be in a different industry, but the job description itself fits your skills and you can apply it in any industry. Put your CV up at a job search site or with a recruiter. Go for interviews! This is a great way of ascertaining your industry worth. Get the name of the position, the approximate earnings, the job responsibilities and requirements for the following questions. 4.1 Find out what growth areas are important to you (You will find this out only when you make contact). What of the above industry related responsibilities are important for you and for growth in your job? What other areas are important that is not mentioned in your newfound knowledge? Discuss this with the group working with you and/or your team members. 4.2 Find out what skills and industry knowledge you need. What are your gaps? Make a list of the competencies and people you require. 4.3 What is your industry worth? Actions: How would your company compensate in money, personal growth and possible participation in greater returns? Discuss with your co-workers and get their impressions and input. In the changing world of work there is almost unlimited work available for people with the right competencies. How does it happen that people are perpetually complaining that there is not enough work to do? Perhaps the problem lies with the skills and competencies a person has to offer to the workplace. This means that you need to gain the right competencies along with work access and work experience in order to ensure a job for yourself (and your future clients). You can do this by exposing yourself to different work situations and by doing work with people who are already have a measure of success in their work situation. This unit illustrates the importance and reasons for you and your clients to work with someone. Preferably this should be someone close to you or someone who is one level superior to you as you will have to take up some of their time in the workplace and time is money! How do you convince them that you are serious about your mission? Show them that you and your career seekers are doing peer group learning and need to learn with them (Module 1). The benefits that they will get out of the experience are personal growth from explaining and talking about their jobs and they can earn money from recruitment and placement fees. You need to empower them to share their work experience with you. Remind them that we are always the owners of our own choices and actions. Their decision to allow you to enter their world of work (as an observer) can make or break you (and your future clients). Our beliefs and attitudes keep us doing what we are currently doing. You can tactfully point out to them that you would not have approached them if you did not know/believe that they are successful role models whom you would like to follow and you know they are certain of their success and will not be threatened by your presence in their work situation. Refer back to the attitude module (PCAR 01W Unit 5) in order to use the information which you studied to strengthen your argument and to convince them of your seriousness. Don’t we often wait for something to happen and then we are disappointed when nothing happens or no one intervenes to change our circumstances? Now you are in the process of getting the tools which make it possible for you to choose to take action and make a difference to your own life and to the lives of others! You can to refer to stratification and communities in PCAR3X Unit 3 to remind yourself of what separates the rich and the poor. It is beliefs and habits which include lack of exposure to different work situations. If you decide to create work related experiences for yourself and others, you have demonstrate an attitude of, “I can” vs. one of “They must” in which you sit back and wait for opportunities to come to you. The difference between South Africa and the United States of America is that South Africans often see work as punishment and something to be avoided. This statement is based on the personal experience of many of our family and friends who have visited or immigrated to the United States. This is prevalent among many young people across all the races. A young South African who only gets his/her first work experience at the age of 18 or higher is literally 3-5 years behind their average American counterpart who will start working in low level minimum wage jobs as early as 15 years. They build up references and preferences from an early age which enable them to make more informed and reliable choices by the time they reach the age of 18. Follow the link below and briefly familiarise yourself with the concept of work ethics and the difference it can make to an individual and a country. Unfortunately, it is difficult for young people to become productive because of unique factors in our country but it is up to you as career guide practitioner to be part of the solution. Competencies determine where and if you can enter the world of work. However, you also need to become aware of the facts regarding the present and future world of work AND increase your knowledge and skills regarding the present and future world of work to change people’s opportunities. All the motivation and reasons for knowledge acquisition are found in the reports in Activity 1 below. These reports are published every year and they keep you up to date with the size and nature of our gaps. Both reports state that access to knowledge and the ability to grasp or interpret that knowledge is the key separator or stratifier between rich and poor. Download the Global Entrepreneurship Monitor Report and view the gaps between rich and poor to become aware of the level and reasons why the rich and poor stay apart. Consider how this knowledge can assist you in motivating people to gain the competencies and join the successful communities and societies matched to their personal choices of industry and work. You will use the same techniques to convince career seekers to build bridges and make their own plans for work access and growth. Discuss what you have learnt with your study colleagues. Use Dictionary and Wikipedia or Google search to explore and discover matching areas. Remember that you are exploring and discovering. The information will inspire you to think about the manner in which you formulate questions that you ask your clients. It should also create an awareness of the level at which you function. How can you use the above information to convince people we are separated by what we know and by our exposure? Write down two specific uses for each. Think about a structured way to use the information to enthuse people into taking action. Write down two actions they can take right now! Capture your personal experiences and discoveries in your MiCareerBook for the CV exercises. Record your experiences while completing the above activities in your MiActivity Book as part of your assignments. You should now know that all resources are readily available and accessible by people with workplace exposure and requisite competencies. If you approach a company or government with no experience or no qualifications asking for help, they will most certainly not pay much attention to you let alone give you access to resources. If you, however, approach them with a plan with experience or with credible qualifications, they will see you as part of the solution to a problem and not the problem itself. You thus come with the support of the leaders in your community and/or a company or institution which makes you a safer investment rather than a risky expense. As career guidance practitioner you should be able to see where you fit in and how you should present yourself as part of the solution and not the problem. The working people in your close proximity form part of the broader successful community. They have access to their workplace and from there can generate further access for you to investigate. Past experience or exposure enabling one to grasp and apply the knowledge. Knowledge of the gaps and a plan to bridge these gaps. When you yourself as PCAR student have mastered these competencies, you are guaranteed access to a vast range of job opportunities. In turn, you can now guide career seekers to help them highlight their gaps and find the solutions by filling the gaps. Remember always show the solution first. How can you facilitate access to the world of work for career seekers? Opportunities are almost limitless for the right competencies. However, how do you use self-drive and self-education to get there? In addition, what opportunities exist with the necessary resources and structures? Discuss what you learnt with your study colleagues. How can a better work ethic benefit both young and old? Name two factors for each (Refer back to Module 1 Unit 5 to recap values). Taking the above information into account, make a list of five prominent gaps that you yourself have in your own personal CV. With the new knowledge, give five solutions to filling those gaps. These can include further education, more work experience or extending your network. People are isolated from work opportunities through the lack of communication skills, ownership for themselves and clear plans of action to bridge the divide? Jobs, resources, opportunities and challenges are freely available in South Africa? Your own awareness and courage to use the resources to fill the gaps in your CV is all that was missing? If you feel that you still are not sure how to fill the gaps in your CV, you need to work through this module again, and specifically mention your problem in your MiActivityBook. We often make the mistake of concerning ourselves with the problem to such an extent that even the solution eventually becomes part of the problem. The above information should get you into a solution based frame of mind, where the focus does not lie in defining the problem but rather in finding a logical solution. Such a solution should provide a means to an end. The solution is simple in its essence but complex in its implementation. Use the tools you have acquired in previous exercises to increase an individual’s awareness of the opportunities around him/her. Guide him/her regarding what needs to be done and how to take advantage of the solutions. Instil an attitude of personal ownership, planning and initiating. Help the career seeker to approach his/her leaders and those with resources with a plan that warrants attention and success. Introduce people to the internet and its benefits. Help people realise the value embedded in their extending communities. The economy grows to accommodate all people. This is due to the new world of work’s ability to change rapidly. Type “economy grows with competencies” into Google search and see what happens! “The world of work is changing”. Type this phrase into Google; choose some web sites that interest you. Can you see how much the workplace has changed, and the fun you can have once you understand this? However, if you do not embrace change and prepare for continuous change, it is not exciting and exhilarating but threatening. Be aware of change, stay with it, and drive it. When you initiate change, you will always be at its forefront. Otherwise, you might become the victim of change and by doing so you set yourself up to be left behind. This is the nature of the new world of work. The only way you can stay ahead is by keeping yourself up to date with the latest knowledge and growth trends within your chosen profession or industry. View the changing world of work web site and view the preparation required for the new world of work. There are limitless jobs and business opportunities for people with the right competencies. Consider how it can assist you in motivating people to gain the competencies and to join successful communities and societies. Which are matched to their personal choices of industry and work? You will use the same techniques to help career seekers to build bridges and make their own plans for work access and growth. How can you use the above information to convince people that everyone can know what they want and plan for the new world of work? Write down two specific uses for each. Think about a structured way to use the information to enthuse people to take action. Write down two actions they can take right now! An example is creating motivation through relevant information and exposure. Practise these skills at home, with friends and use them in the work place. 1. The first step is for you to believe what you have read and learnt in PCAR. 2. The next step is to help other people come to similar conclusions and realisations. You now know there are many jobs available in South Africa. People who come to you as clients seeking jobs should also know this. You know that specific competencies coupled with an action plan ensure access to jobs. Your clients need to know this too. In order to do this, you must help your clients become aware of their work preferences and to be knowledgeable about their industry of choice, specifically their work of choice within that industry. Then you should assist them to plan a written work access plan which they are prepared to follow and implement. At this stage of the Programme for Career Guidance Practitioners, you know enough about the world of work to give your clients a vision of themselves in a specific job in the world of work. The competencies which you have acquired for yourself as career guidance practitioner will set you on the path to join successful people. Your success helps you to invest in the future of others and achieve further personal success! Just like Bill Gates did.